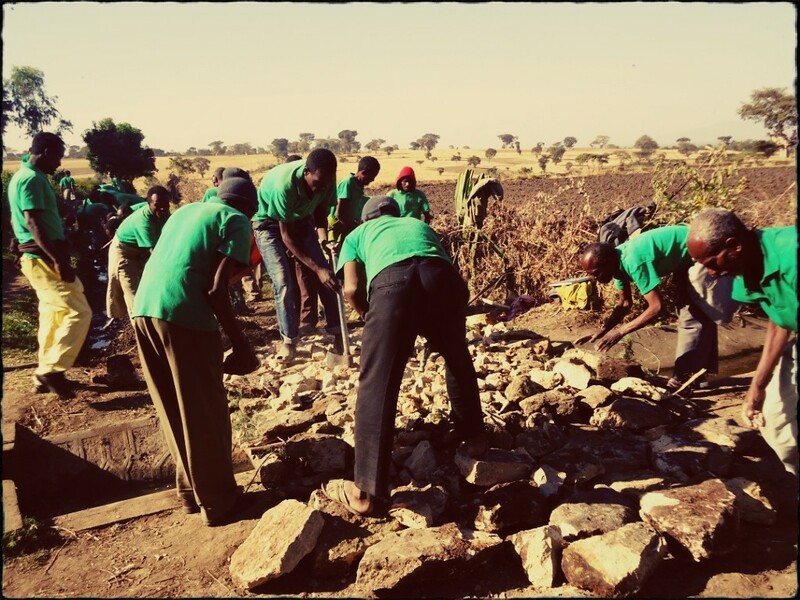 The Foresight Fathers have been busy – planting, building, and preparing the ground. 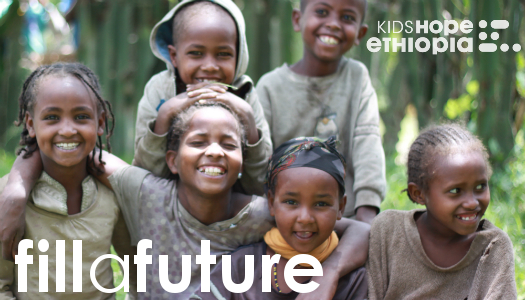 Kids Hope Ethiopia has had great success in seeing many students be accepted into universities, colleges, technical and trade schools, and vocational training programs. We have students enrolled in health officer training, nursing school, engineering programs, lab technician programs, accounting programs, hairdressing school, culinary school, computer technology institutions, attaining woodworking and metalworking certificates, and more. While gaining their education the students have a variety of costs such as tuition, transportation, books, and living expenses. These costs and fees can be prohibitive to a students being able to attend post-secondary education, even though they have been accepted. Support A Scholar donations will go directly to helping these students meet their needs as they earn their degrees, certificates, and diplomas. Education is more than what you learn at school. Our new education support center will have extra-curricular programs for the students – music clubs, drama, reading, soccer, poetry, art, and whatever else the students are interested in. 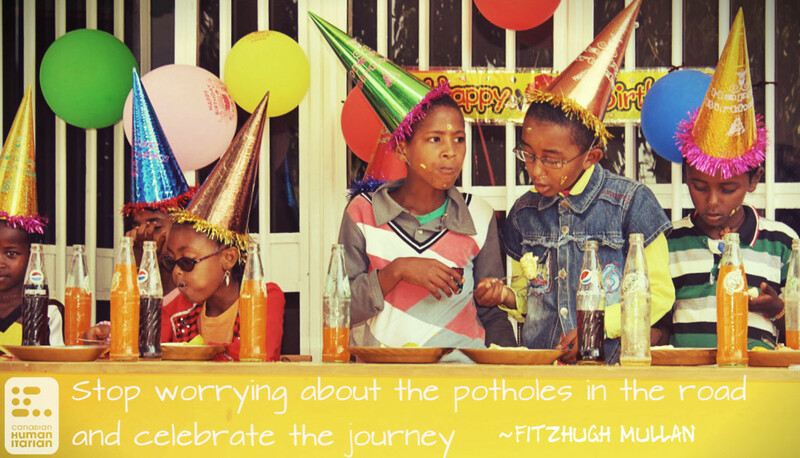 Fill their future with all the things they hope for. 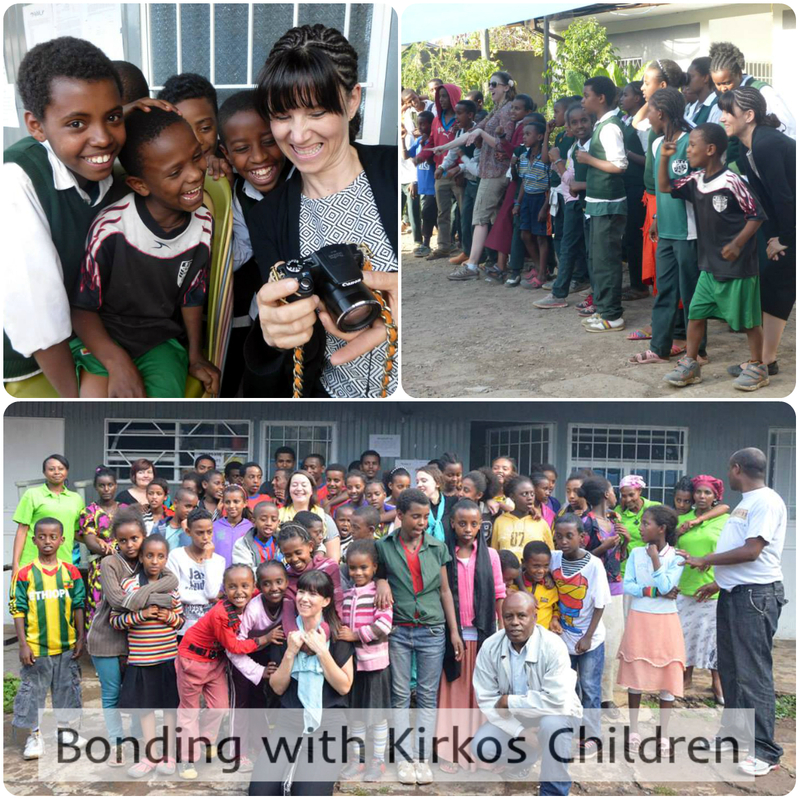 Students at our Kirkos Center have been the recipients of many visitors in the first half of 2014. 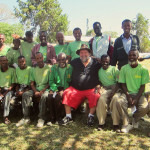 We had twenty (20) volunteers in February and five (5) in May. Each group brought special life skills, they spent time playing, visiting student homes, and getting to know these students better. Several nurses took time to discuss and teach about infectious diseases, how they spread, and the role of immunization to prevent infection. The kids were very interested in hearing the story of the first vaccine developed by Mr. Louis Pasteur for Rabies, and about immunization programs that now exist to help prevent more diseases. The students are so welcoming! 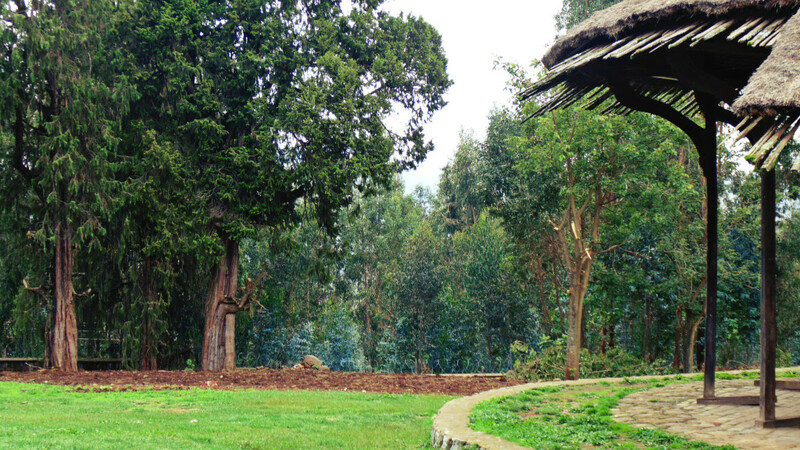 Culturally, a welcome in Ethiopia means being invited to dance, sing, and have a cup of coffee. 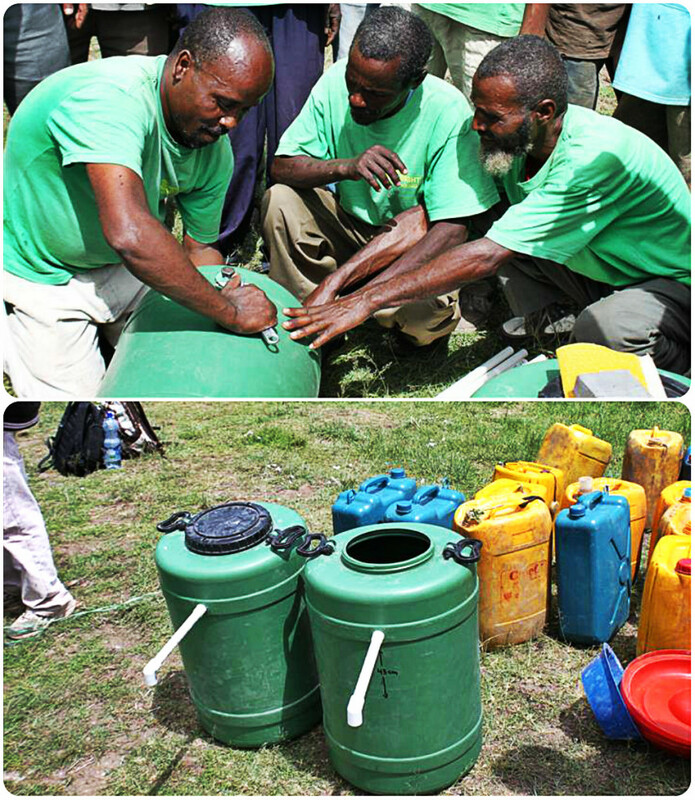 The volunteers had lots of time to participate in these activities! Kirkos Center has a very enthusiastic Dance Club troupe. 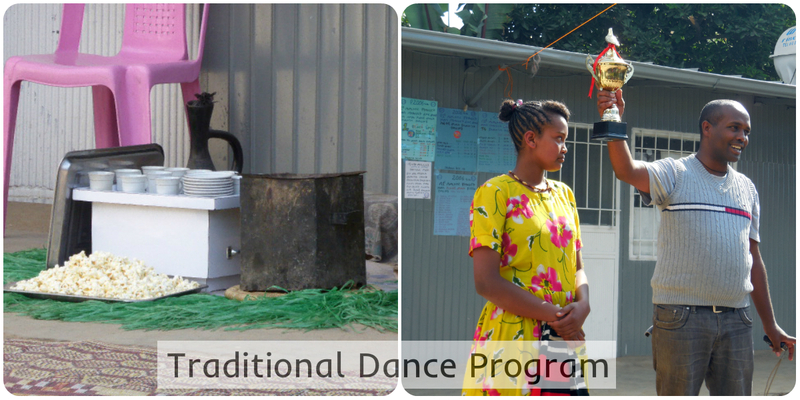 They have been performing and competing in dance recitals all over the city of Addis. 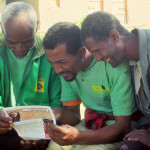 In January, they won the Addis Ababa City Wide Competition, 1st Place Gold Cup. As you can imagine, the whole center is very proud of this dance group. The May group helped the students to make special gift flowers out of tissue paper, to give to someone in their life who is a Mother-figure to them. The students loved this special activity. For many, a staff member of their education center was their Mother figure. The children also wrote a small note to their mother and made little 3 dimensional pictures to finish their gift. The students loved this activity! 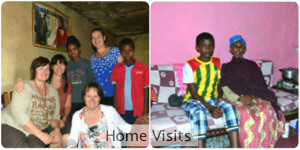 Each expedition group takes some time to visit the student’s families. 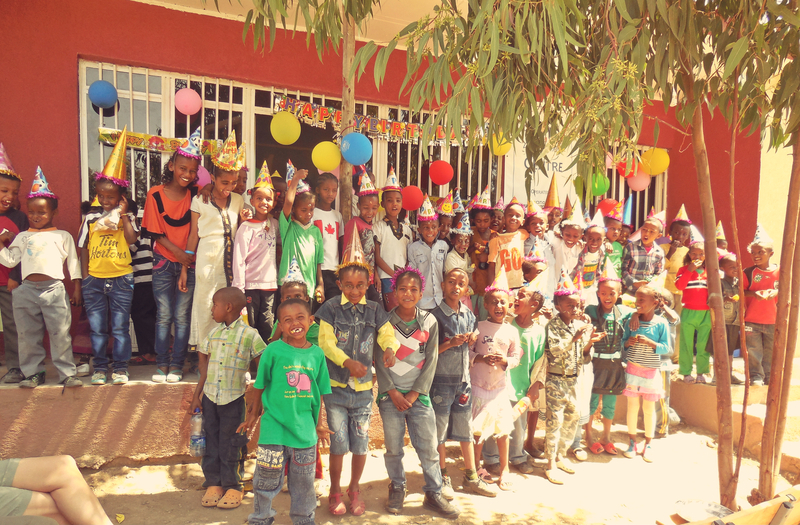 This honors them, and acknowledges their important role in supporting the student in their efforts to attend school fulltime, and to attend the Education Center after school. So far this year, we have had several opportunities to visit with the families of some of the students from the Kirkos Center. 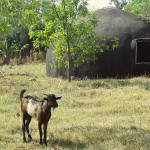 Many students who used to attend the Kirkos Education Center programs are now in college, university, or technical schools. 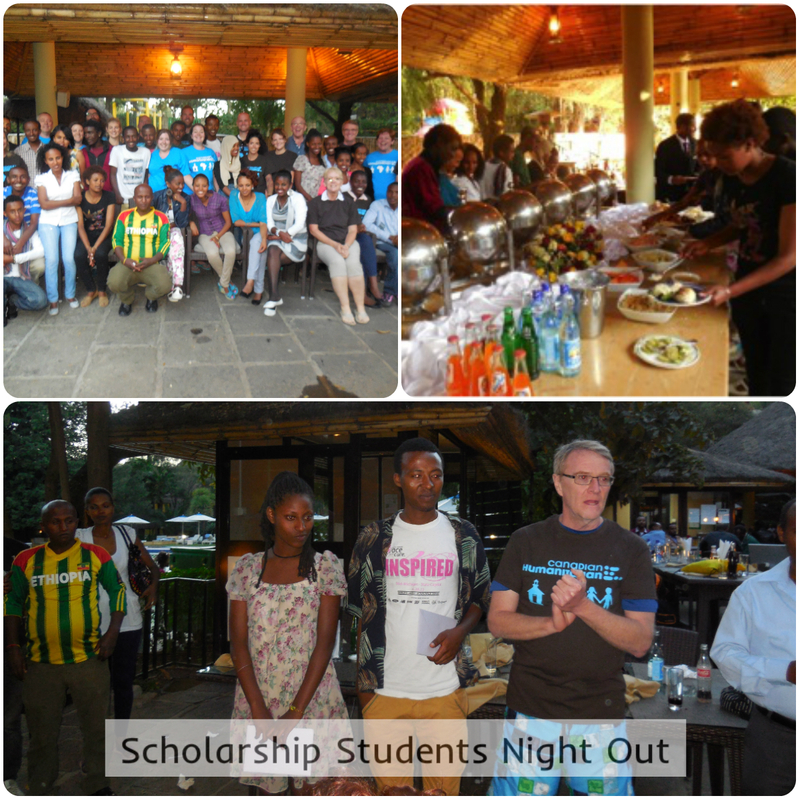 In February we had the opportunity to gather volunteers and students together to spend an evening visiting, eating, and swimming. Two former Kirkos Center students received a special grant and award, the Manji-Burghardt Scholarship, for achieving a GPA over 3.8 for the full academic year. 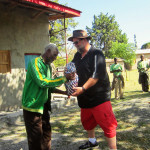 This award included a laptop for each student, and $1000 BIRR ($50 USD) grant. 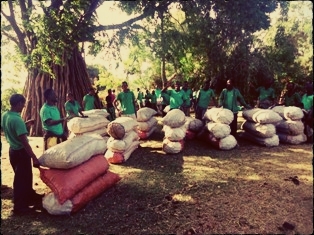 These items were presented to them in July, by the Global Youth Expedition team members. The students were surprised and excited to receive it. It was a great evening to meet together as guests of the Hilton Addis Ababa. 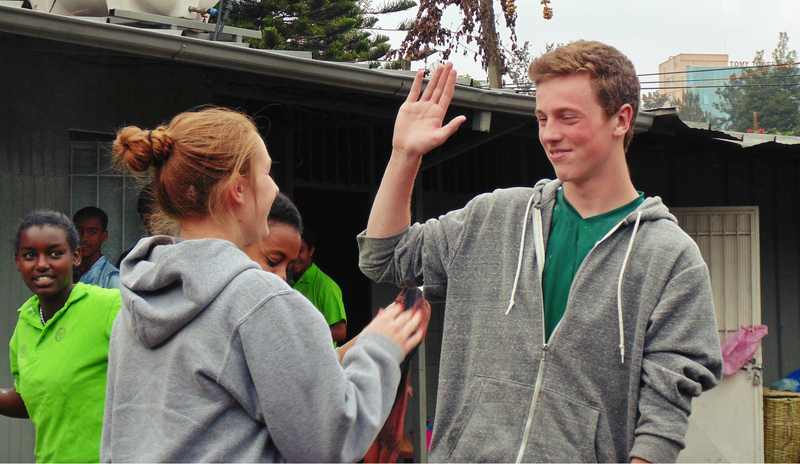 All of our volunteers comment on how much they grow to love the students in our programs. It is amazing that in such a short amount of time that a bond of friendship and trust can be forged so strongly. This has been true for our volunteers in 2014. Kids love to play, have their picture taken, and give out hugs! Many of their games are reminiscent of old time outdoor games we recognize from home. 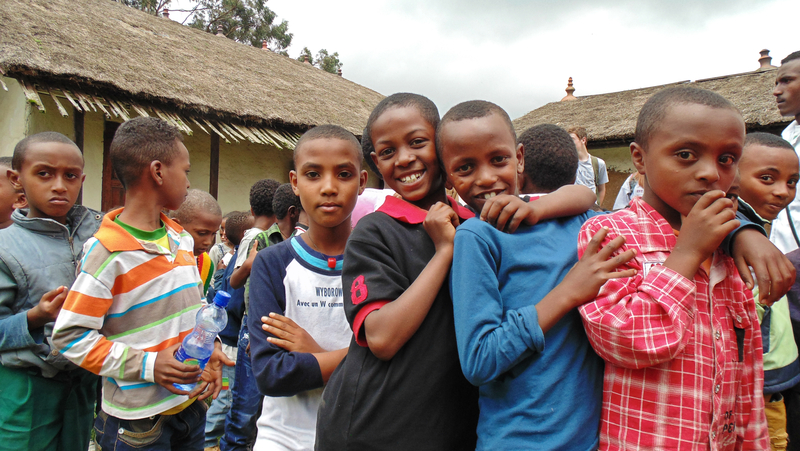 Games like “Red Rover”, “Duck Duck Goose”, “What time is it Mr Wolf?”, each with their own Ethiopian flavor, are loved by everyone! If you would like to sponsor a child, contact Rachel. See this update as a newsletter. The Education Support Center isn’t just for the children – it’s for their whole family at home. 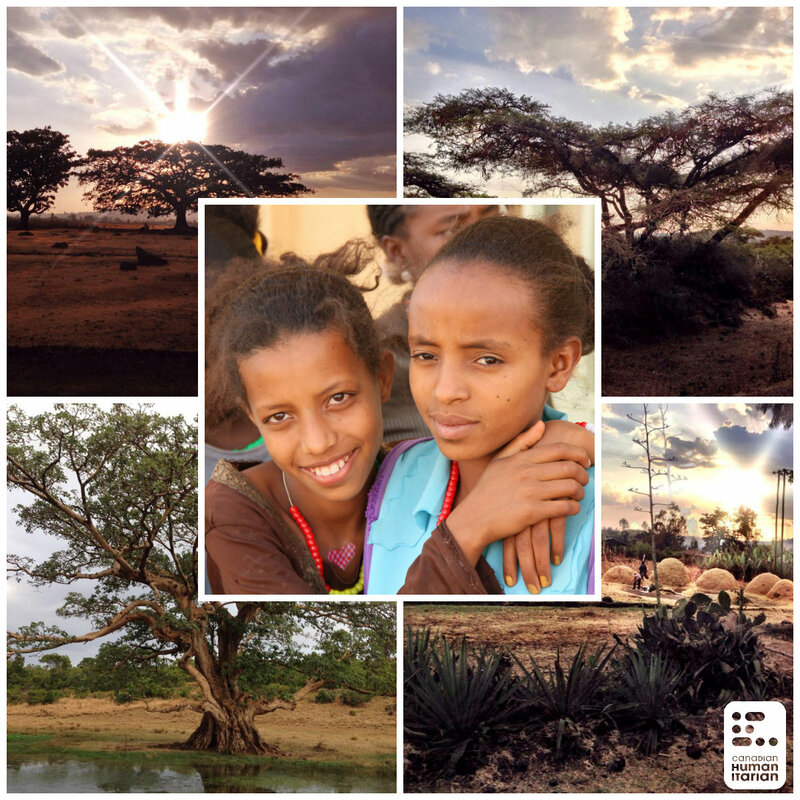 Support education and information programs for the student’s guardians, such as entrepreneurial skills, hygiene, and money management sessions, to help improve every aspect of a child’s life. 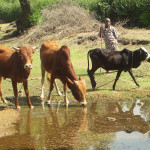 Fill their home with hope, and a better future. Students in our Kality Program, run at the VCS Love and Hope Center, have been the recipients of many visitors in the first half of 2014. 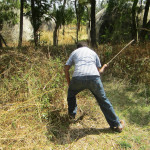 We had twenty (20) volunteers in February and another group of five (5) volunteers in May. Each group brought special life skills, and spent time playing, visiting student homes, and getting to know these students better. Volunteers had the chance to help students with their personal grooming time on a Saturday. At the common wash up area, many of the students were washing hair, their faces, and were helped along the way. The students at Kality get to celebrate student’s birthdays every 3 months. The March celebration was particularly festive, with dancing, recitations, and LOTS of cake and treats. It was charming to see the students help each other spread cake frosting on their noses and foreheads, traditionally a birthday celebration activity. The May group helped the students to make special gift flowers out of tissue paper, to give to someone in their life who is a Mother-figure to them. The students loved this special activity. For many, a staff member of their education center was their Mother-figure. 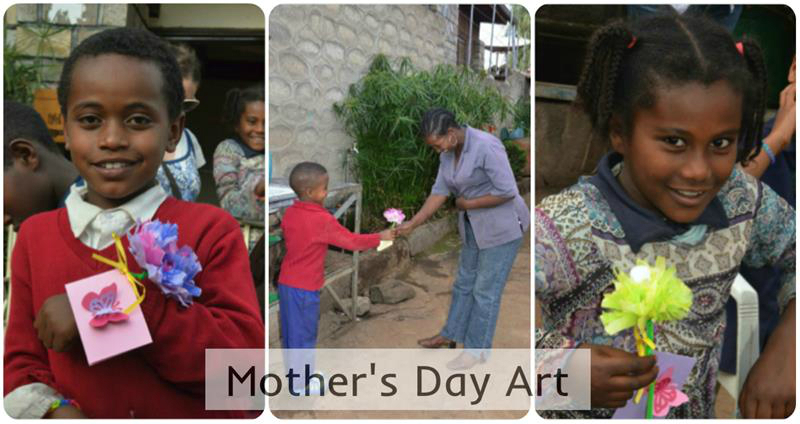 The children also wrote a small note to their mother and made little 3 dimensional pictures to finish their gift. 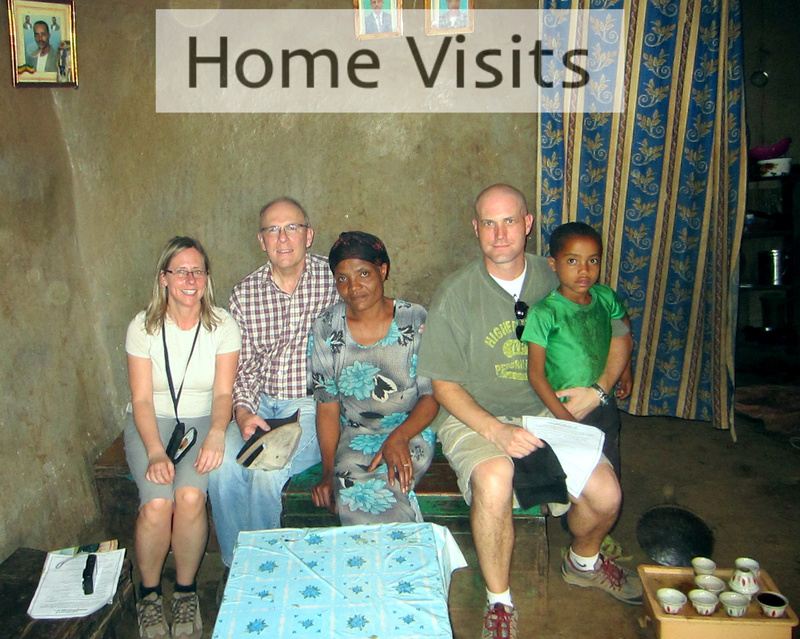 Each expedition group takes some time to visit the student’s families. This honors them, and acknowledges their important role in supporting the student in their efforts to attend school fulltime and the Education Center after school. While home visits can be emotionally challenging for our volunteers, they always report back to us that it is also one of the highlights of their volunteer experience. 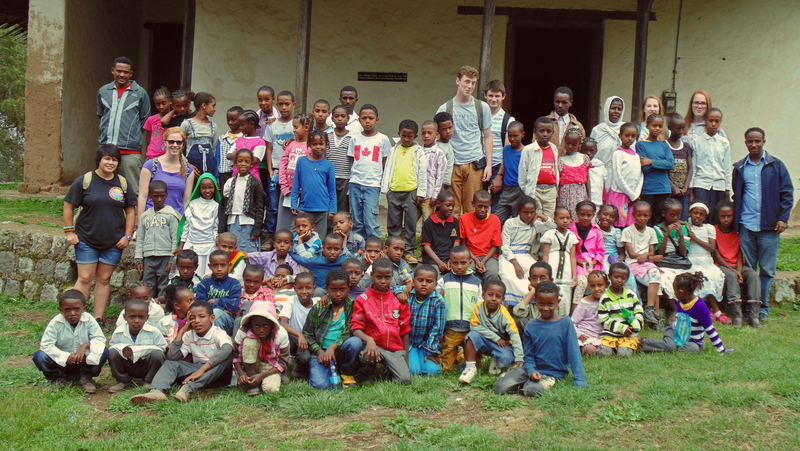 All student families report to Kids Hope Ethiopia that they LOVE having volunteers visit them personally. 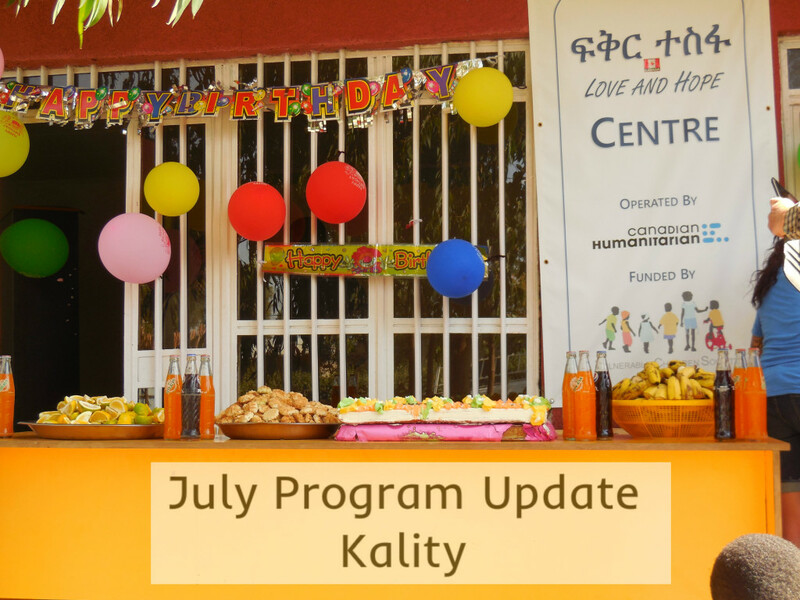 We have had the chance to visit several families of the students in the Kality Program so far this year. 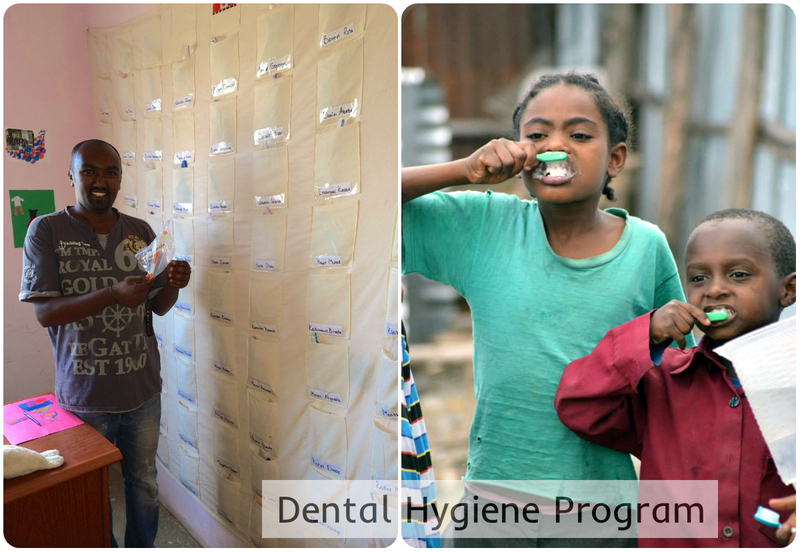 Kality is still working very hard on its dental hygiene program, and volunteers helped encourage students to keep their teeth clean! 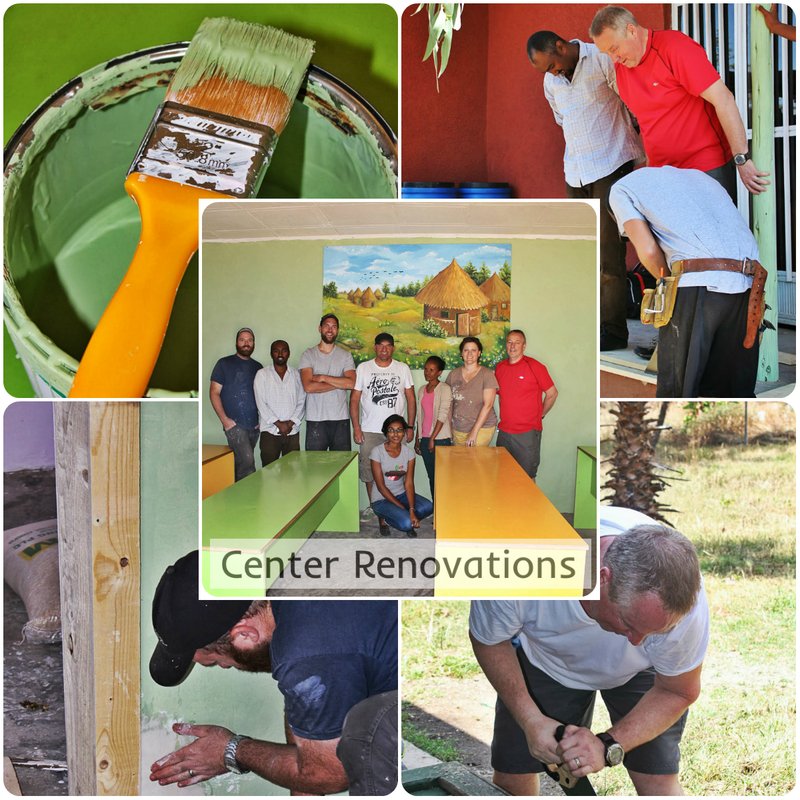 February volunteers included construction workers from Canada. 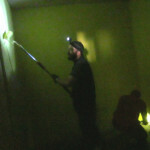 They helped to paint, fix up and do an overall renewal of the Kality Building. 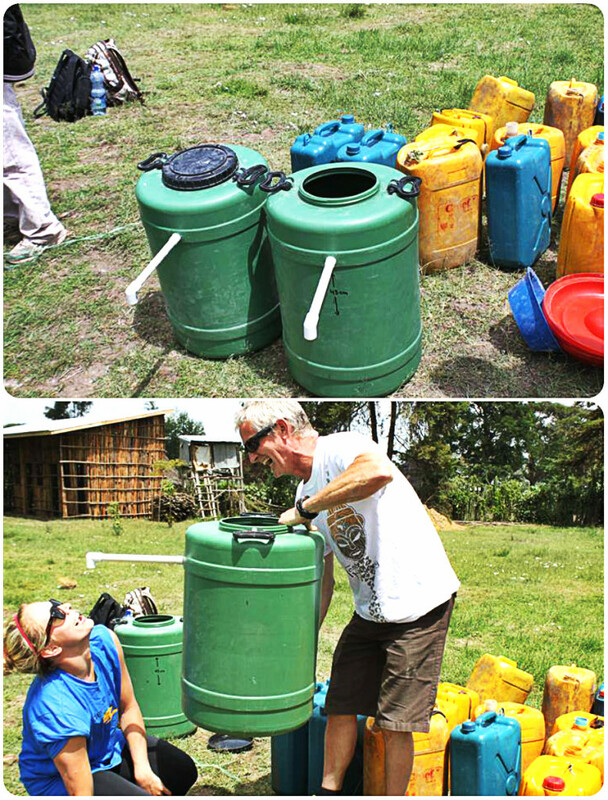 They even taught some of the local center staff how to do these kinds of repairs too! Thanks to their efforts the building looks beautiful! Global Youth Expedition: Fun and Games at Kirkos! We spent our last day at Kirkos Center enjoying the program that the students had put together for us, and playing games together. 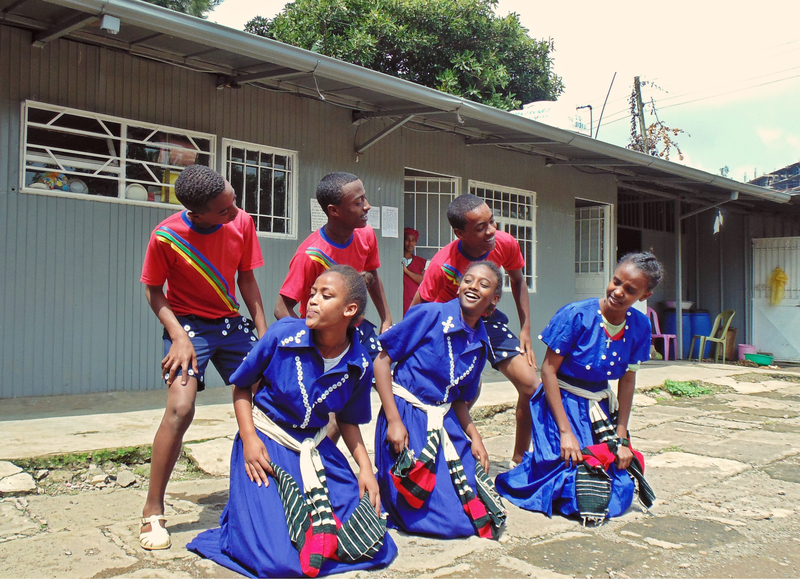 Kirkos Center has a wonderful student dance troupe. They have won city-wide competitions for traditional dance. 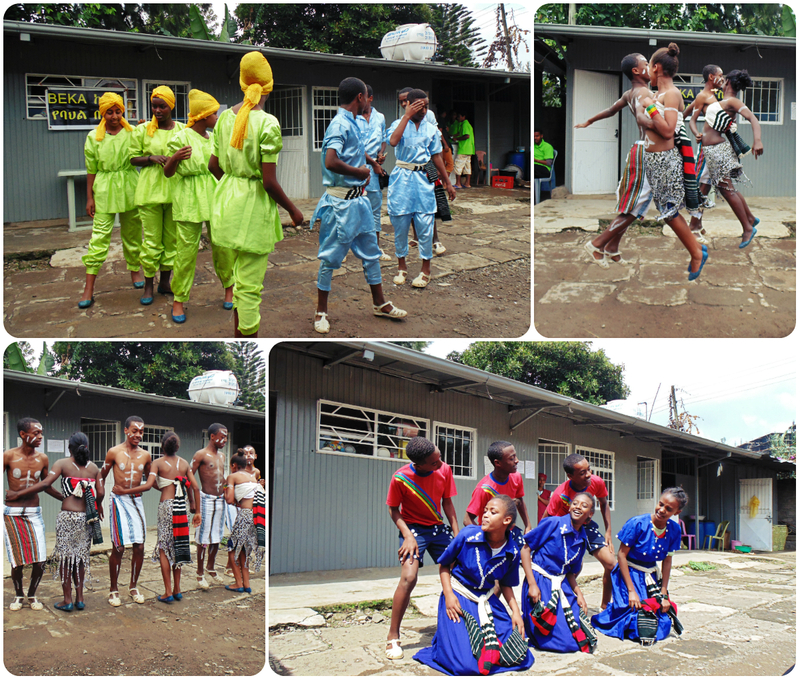 We were treated to several different cultural dances from them, and it was awesome! 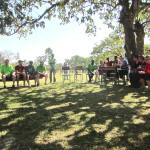 The older students planned the program out, and had thought up several games to include our Global Youth volunteers in. 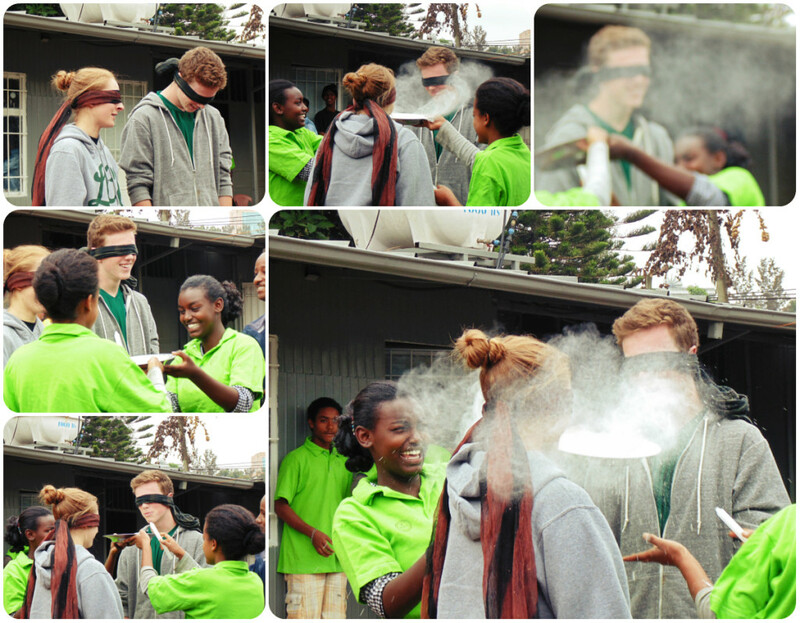 Such as blowing flour in someone’s face while blindfolded! 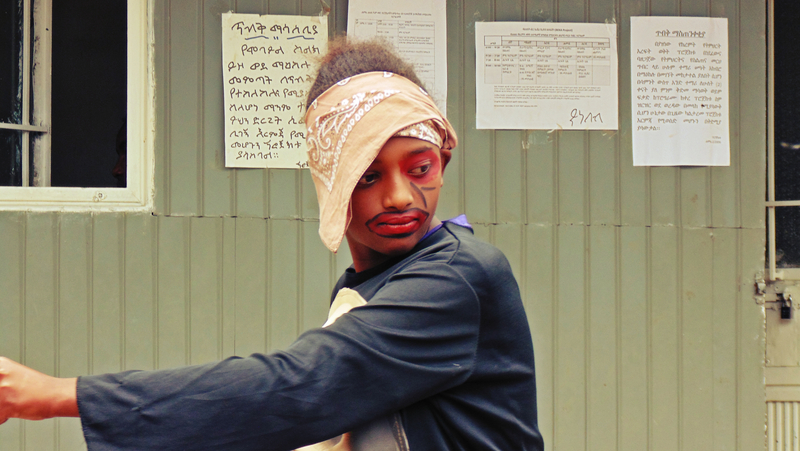 Kirkos also has a very active Drama Club, and this trip they entertained us with several different miming skits. This one was about a burglar – which explains the makeup! 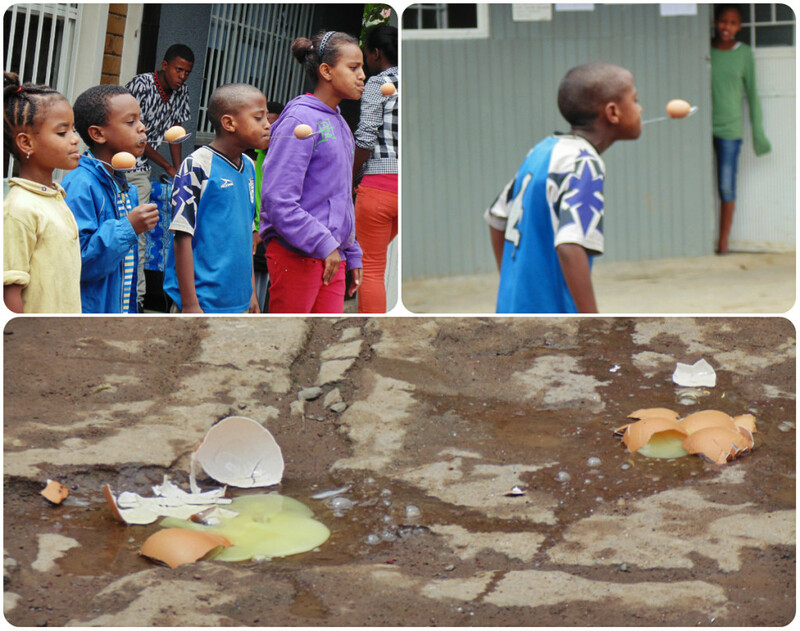 Egg races! 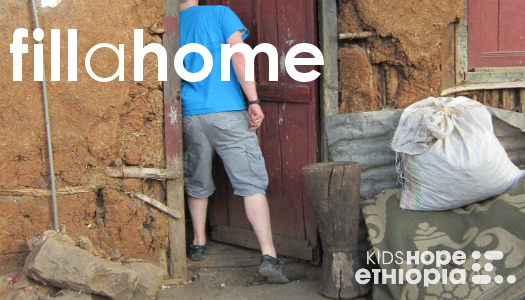 Our Global Youth team didn’t last very long – the students at Kirkos are really good at this! This was our final day working at the Kirkos Center – playing games and dancing with the students was the perfect way to end our visit there. Thank you Kirkos! 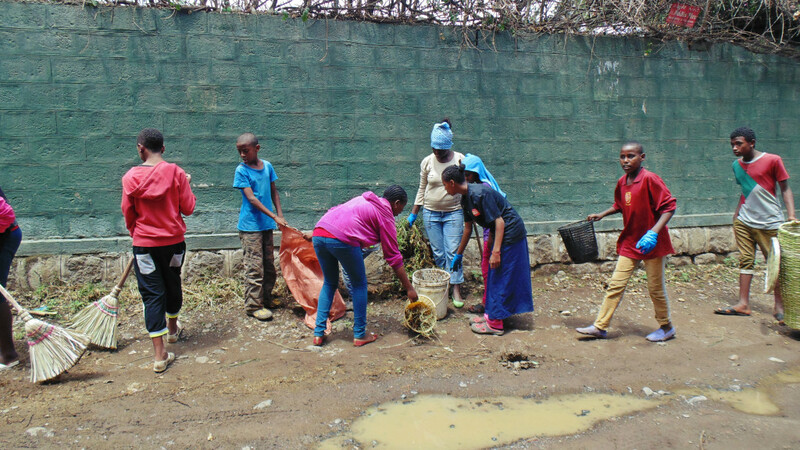 After learning about why it is important to keep our environment clean from our volunteers, the students at Kirkos Program held a community clean-up activity. 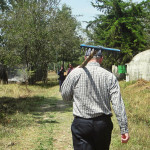 We started with the center itself, and then moved into the streets nearby – picking up garbage and pulling weeds, then taking everything to a dumpster to be properly disposed of. 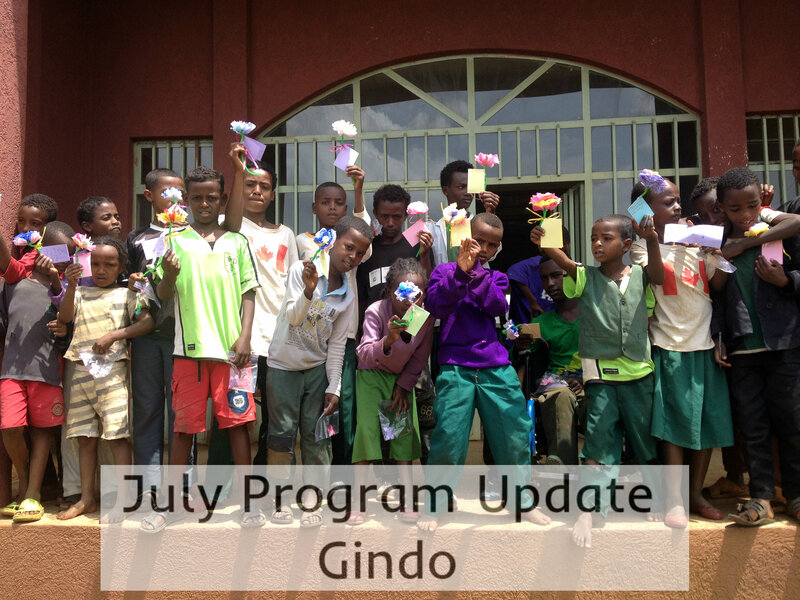 Students at our Gindo Center have been the recipients of many visitors in the first half of 2014. 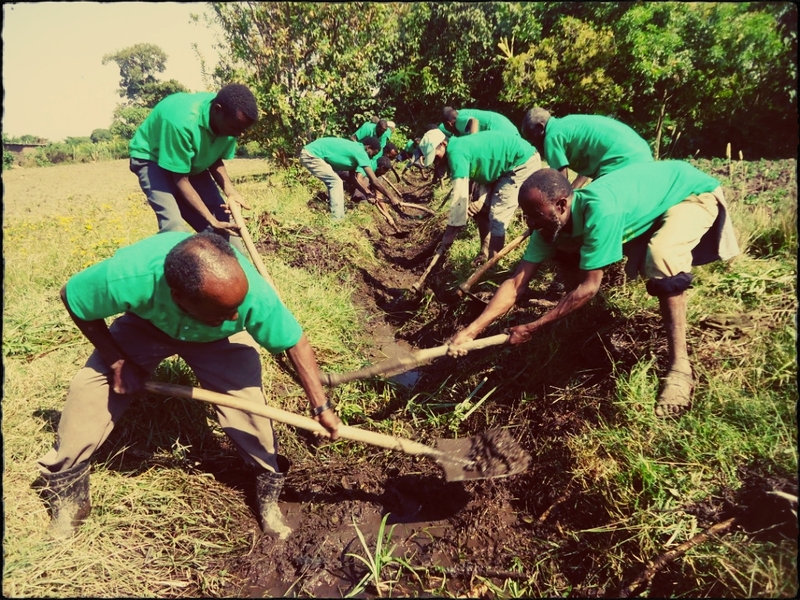 We had twenty (20) volunteers in February and others as they have been able to travel the roads during rainy season. Each group brought special life skills, and spent time playing, visiting student homes, getting to know these students better. 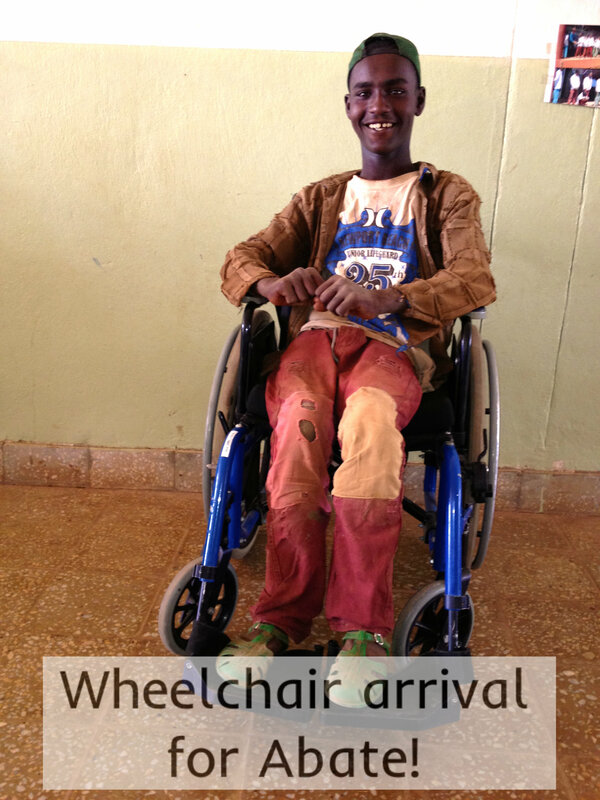 Thanks to generous donations of volunteers, Abate from the Gindo Center was able to have a wheelchair specially measured and made for him. With the chair, came a tutoring course, and specialized tools so he can repair and care for this chair on his own. Abate will graduate this year from the center, as he is now 19 years old. 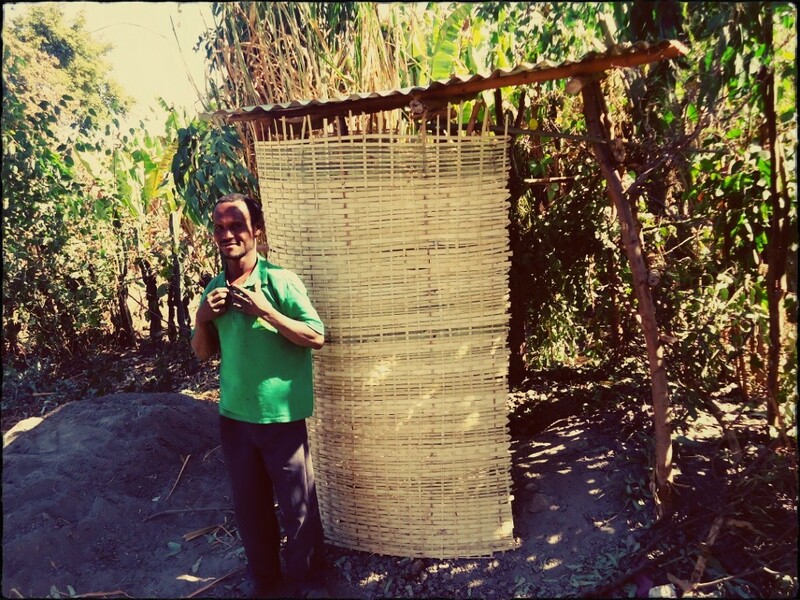 Center staff have been working with him to learn a skill so he can run his own little business. Being off the ground, and mobile are HUGE improvements for his life. 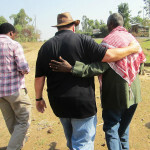 THANK YOU to the Gindo Center staff and volunteers who have made this dream come true for Abate. Equal with the others! 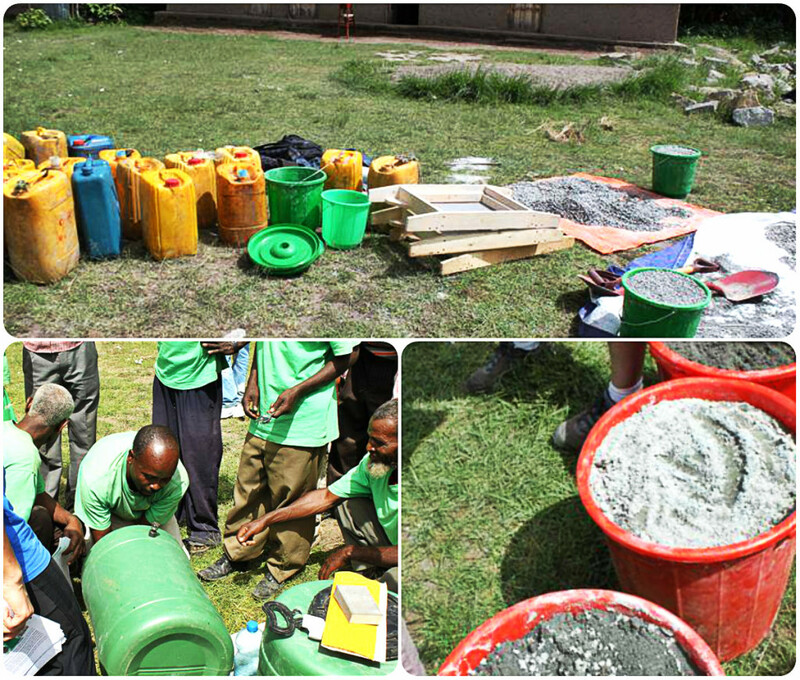 Personal grooming kits were given to each student as part of the February expedition group. 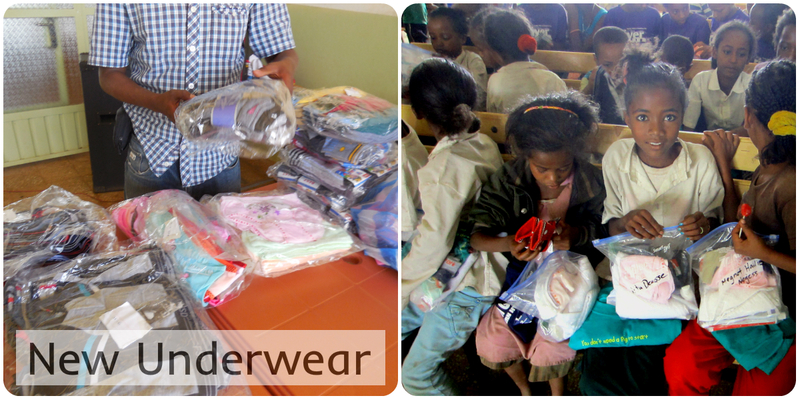 Students, and staff happily accepted new socks, underwear, t-shirt, candy, and a toothbrush. 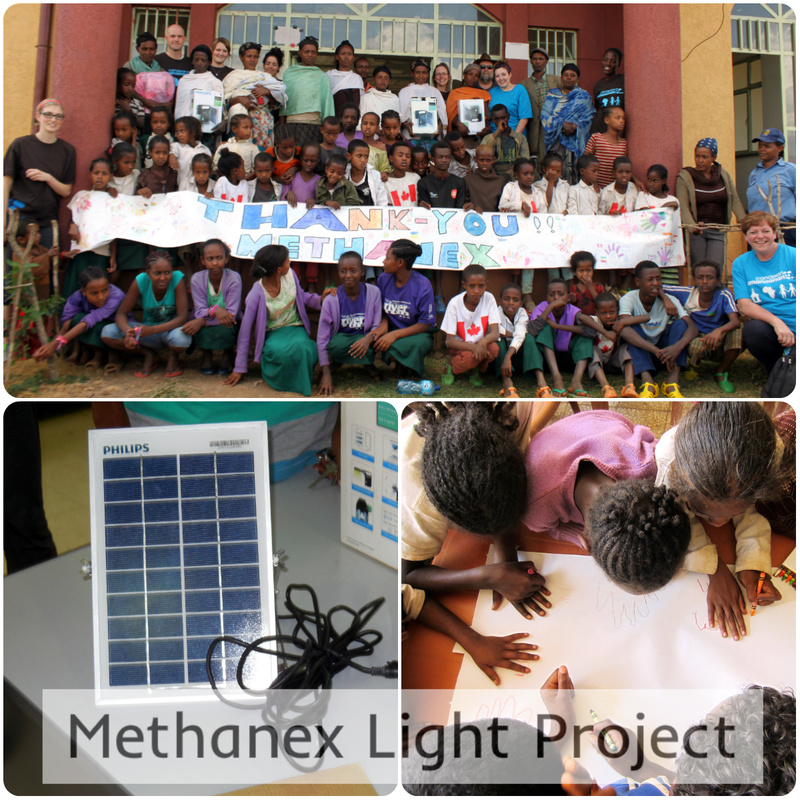 In the fall of 2013, Methanex sponsored a Global Awareness challenge with a high school in Medicine Hat. 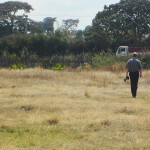 Challenging the students to come up with a solution to a need in Gindo that could be helped with a budget of $1000. 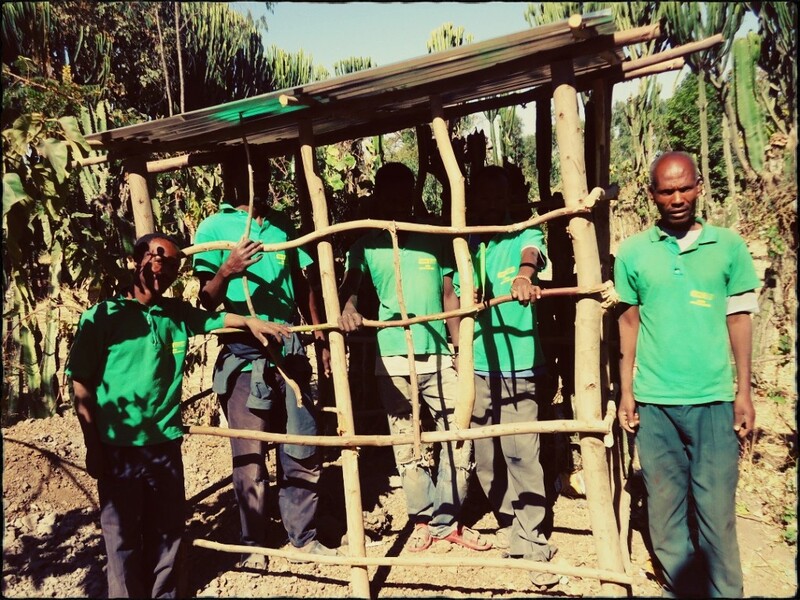 The outcome of this challenge was a solar powered light project, that is now providing light to 10 families in the Gindo area. The students had a fun time in February creating thank you banners for both Methanex and the participating students. The May group helped the students to make special gift flowers out of tissue paper, to give to someone in their life who is a Mother-figure to them. The students loved this special activity. For many, a staff member of their education center was their Mother figure. 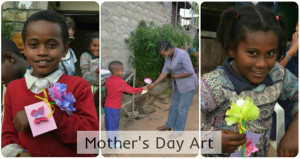 The children also wrote a small note to their mother and made little 3 dimensional pictures to finish their gift. These gifts were beautiful, and the students were excited to make them. Each expedition group takes some time to visit the student’s families. This honors them, and acknowledges their important role in supporting the student in their efforts to attend school fulltime, and to attend the Education Center after school. 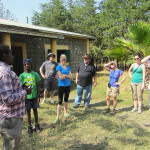 Throughout the past 6 months, we have visited several of the families of students in the Gindo Center. 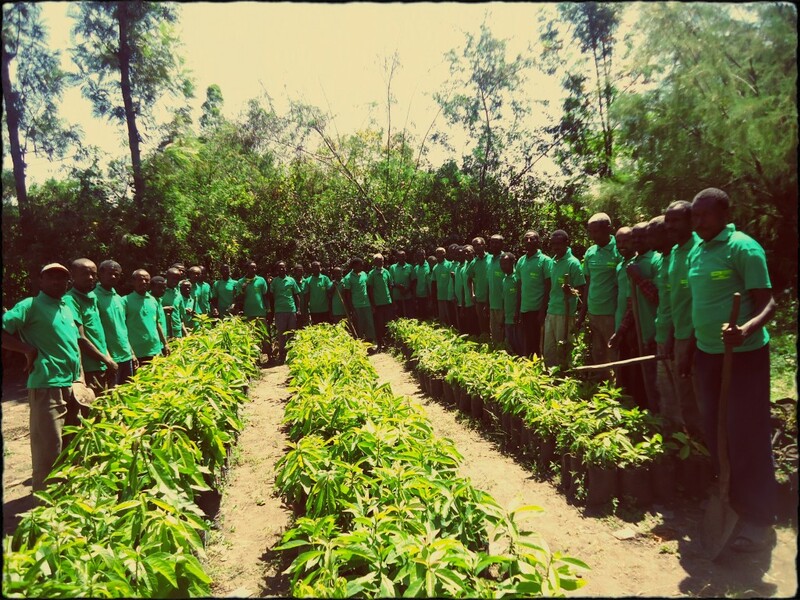 We have 50 new students in our Education Support Center in Lira. Provide medical support for them – including an annual check-up, and ongoing care for immediate medical needs. 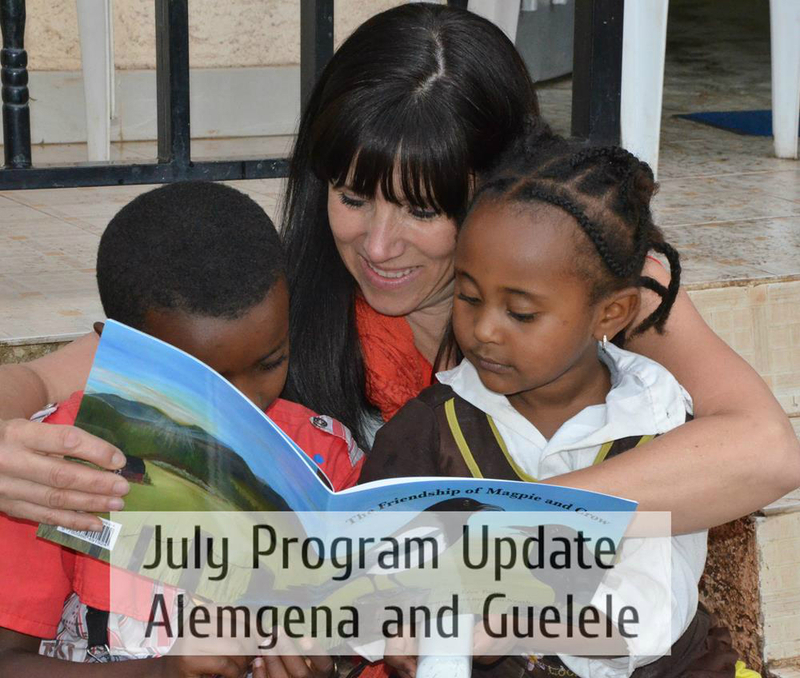 Students at both our Alemgena and Guelele Centers have been the recipients of many visitors in the first half of 2014. 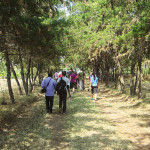 We had twenty (20) volunteers in February and another group of five (5) volunteers in May. Each group brought special life skills, and spent time playing, visiting student homes, getting to know these two centers better. 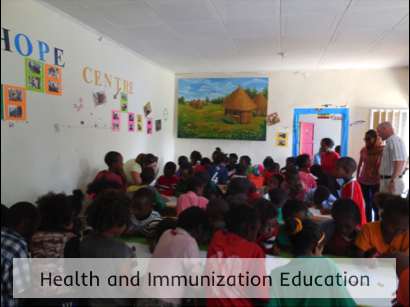 Several nurses took time to discuss and teach about infectious diseases, how they spread, and the role of immunization to prevent infection. 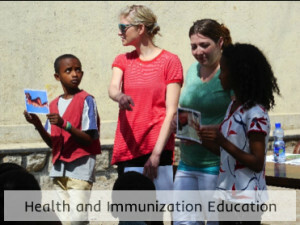 The kids were very interested in hearing the story of the first vaccine developed by Mr. Louis Pasteur for Rabies, and about immunizations programs that now exist to help prevent more diseases. 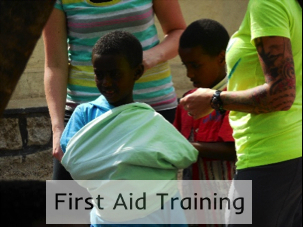 A second team of nurses worked with students to help them understand some basic principles of First Aid, how to make a sling, put on bandages, and stop excessive bleeding. This picture shows a real honest effort by a group of Grade 2 students to put a sling on their classmate. They eventually learned how to do the classic sling to perfection. The students are so welcoming! 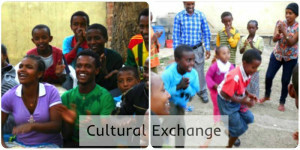 Culturally, a welcome in Ethiopia means being invited to dance, sing, and have a cup of coffee. 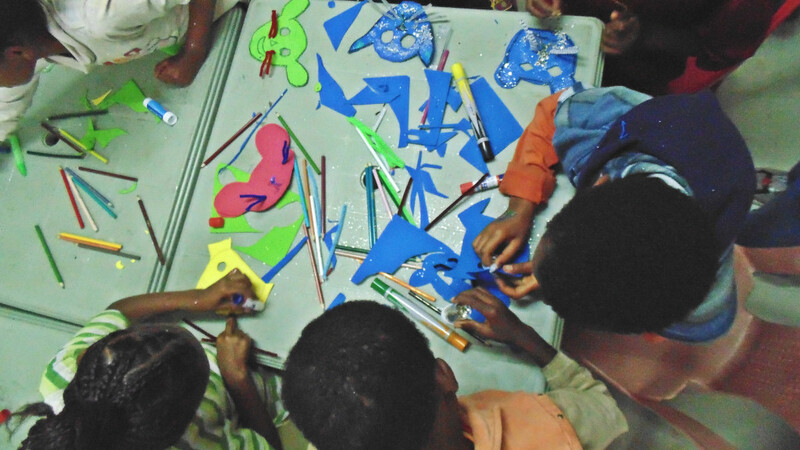 The volunteers had lots of time to participate in these activities! 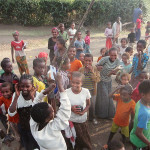 Using an empty jerry can for a drum, students all join in singing and others teach volunteers how to shake their shoulders in the traditional manner that is basic to all Ethiopian cultural dance. The May group helped the students to make special gift flowers out of tissue paper, to give to someone in their life who is a Mother-figure to them.The students loved this special activity. 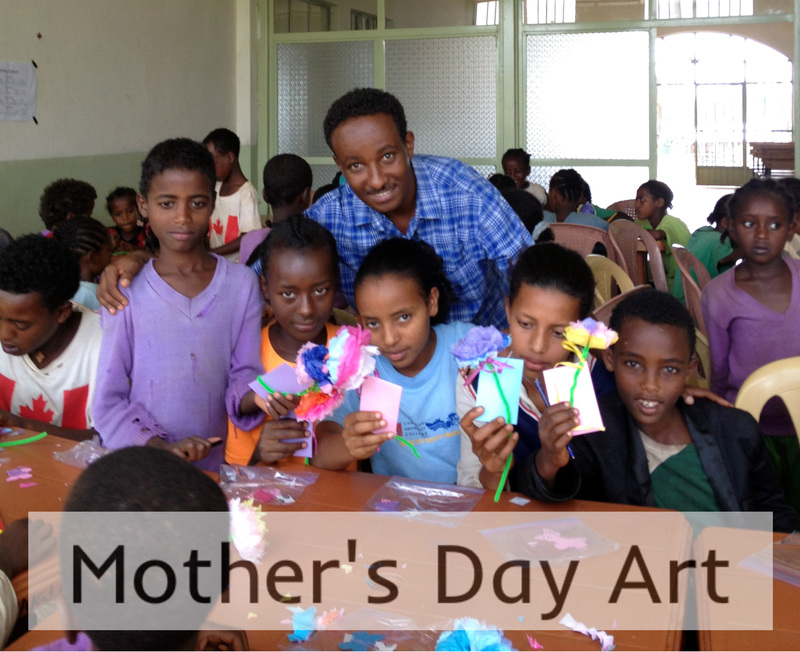 For many, a staff member of their education center was their Mother-figure.The children also wrote a small note to their mother and made little 3 dimensional pictures to finish their gift. The students loved this activity! 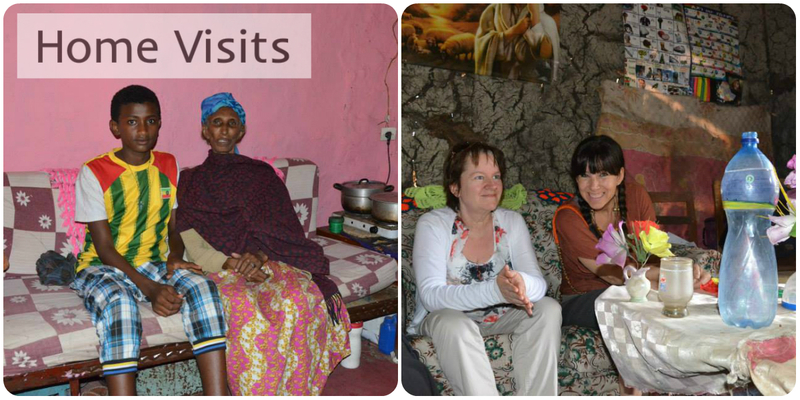 Each expedition group takes some time to visit the student’s families. 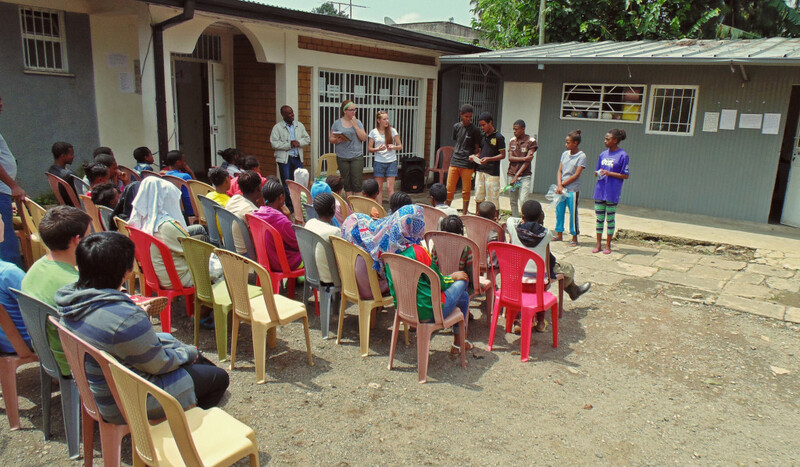 This honors the family by acknowledging their important role in supporting the student in their efforts to attend school full-time and to attend the Education Center after school. 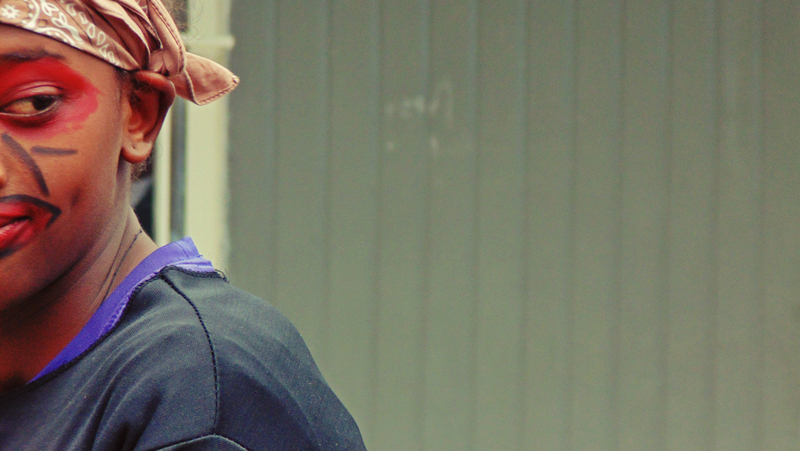 While home visits can be emotionally challenging for our volunteers, they always report back to us that it is also one of the highlights of their volunteer experience. 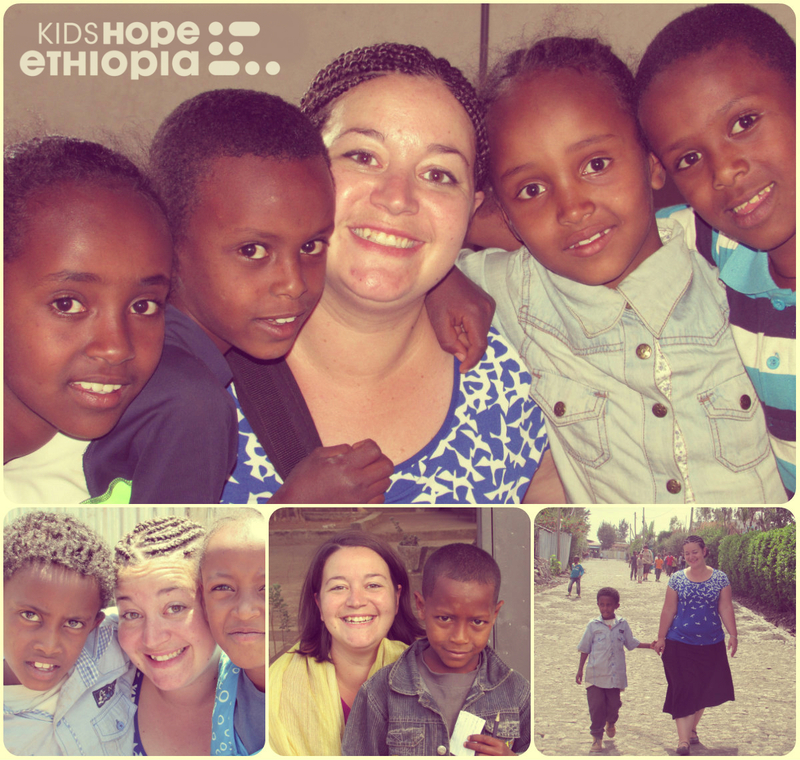 All student families report to Kids Hope Ethiopia that they LOVE having volunteers visit them personally. 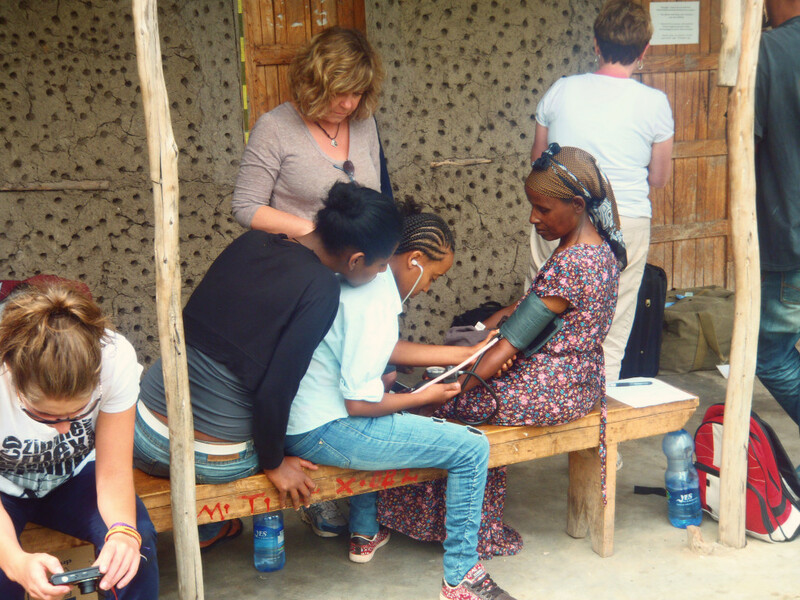 Students at both Alemgena and Guelele had annual physicals completed with the help of volunteer nurses and doctors. 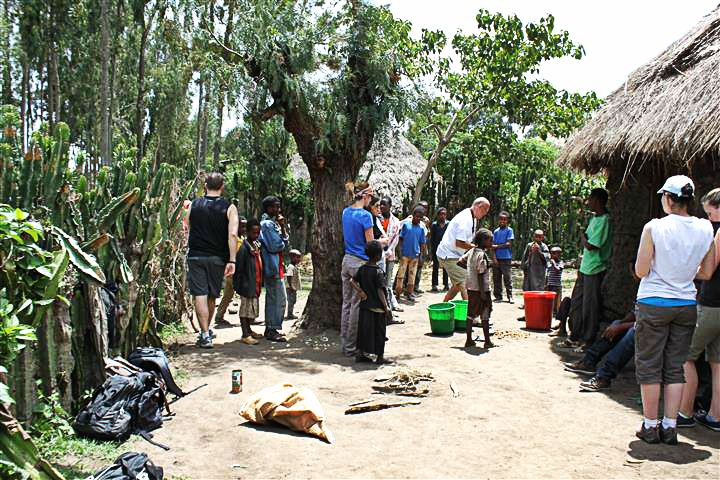 For many of the new students coming into Guelele and Alemgena, this was their first experience to have a doctor see them. 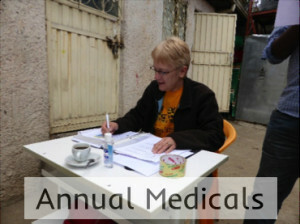 At first they were nervous, but that quickly faded with the help of our friendly and caring medical volunteers. All the students are spending their summer preparing for the upcoming school year, and were also visited by the Global Youth Expedition in July. 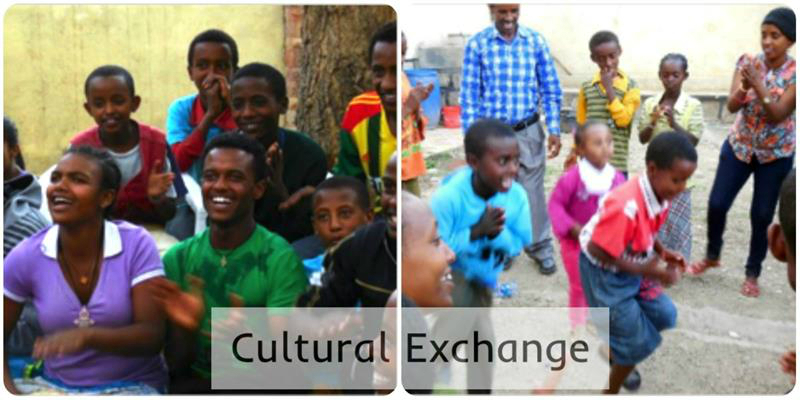 We were greeted by the students at the Kirkos Center with warm smiles and lots of excitement! The Kirkos Center is very proud of their Dance Club, and were very happy to perform many different dances for us during the 3 days we spent with them. Our first presentation was given by two of our Global Youth Expedition team members. They taught about the importance of keeping our environment clean, and different ways we can recycle and reuse to reduce our waste. In the afternoon, we made animal masks to go with the story we read with the students. Mice, cats, dogs, and hens – all of them covered in glitter! 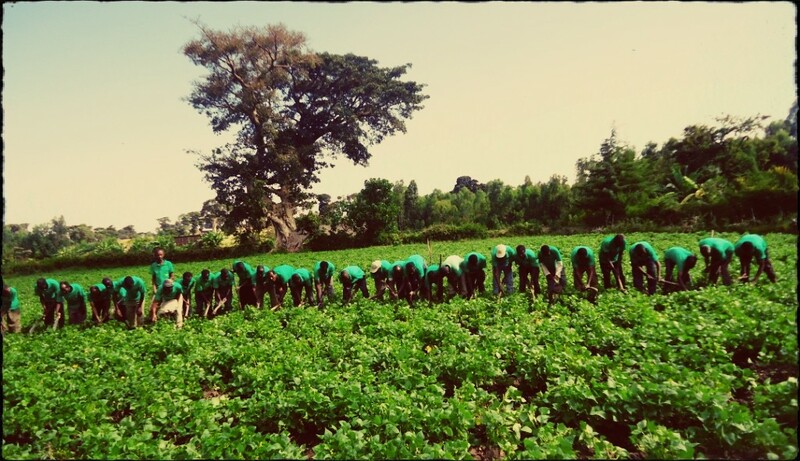 We spent a day joining a field trip with the students of the Kality Program. 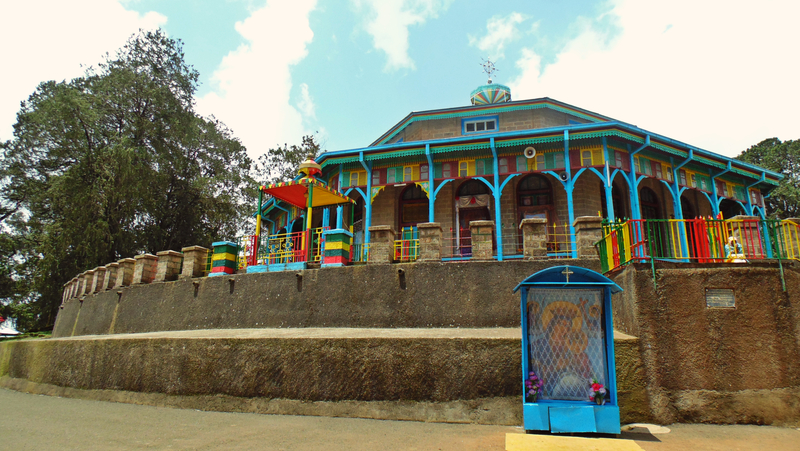 We met at the top of a mountain, Entoto Mariam, and toured a museum featuring the history of Ethiopia, admired this beautiful old church, and visited the former palace residence of the old Emperors of Ethiopia. It was a beautiful day for our outing! 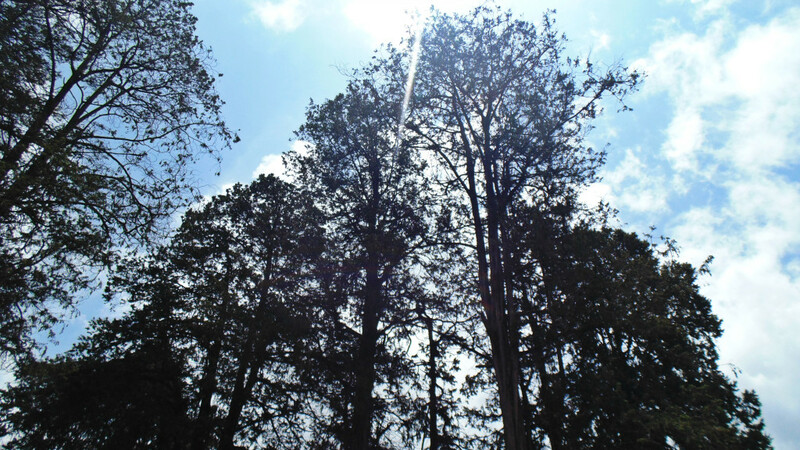 We loved having the sunshine. The palace is not all that large – but beautifully built. 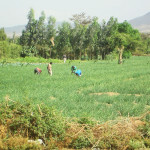 They still use the grounds for farming, and you can see that a section of the yard has been plowed for planting crops. The students had a great time! And they love having their picture taken. 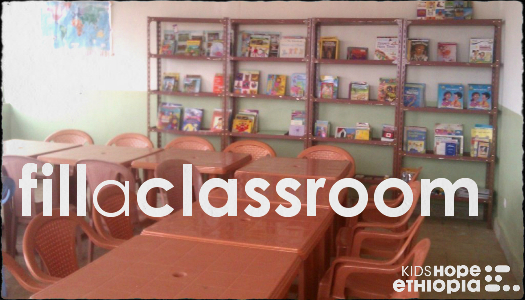 Our Education Support Center in Lira, Uganda needs tables, chairs and bookshelves – fill a classroom with the furniture it needs, so students have a place to do their homework! 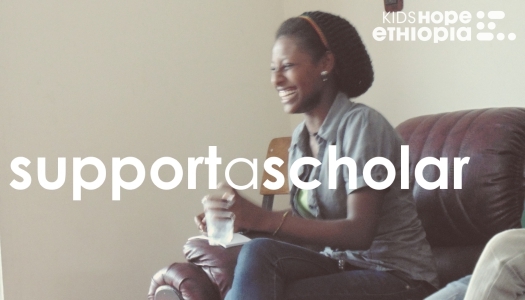 Help our students stay in school – fill up their school by providing their tuition fees for a year. $30 will cover their annual tuition. Our new Education Support Center in Lira is starting to fill up with supplies and needed items for the students. Help us put books in their library – let’s fill it up! 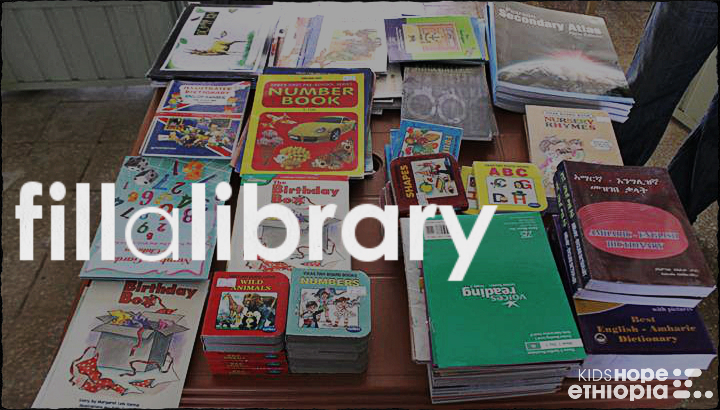 $40 will add about 10 books to their collection, so help the library shelves fill up! 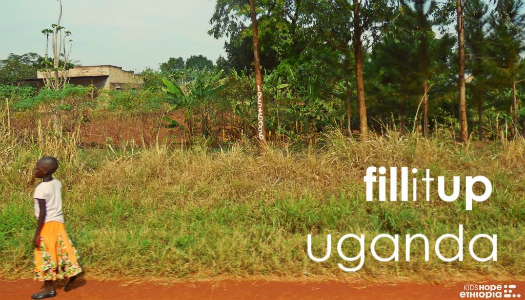 Fill it up – Uganda! 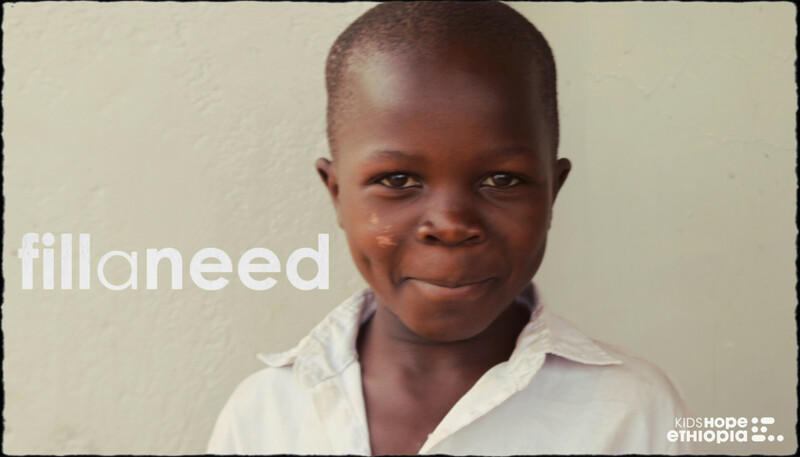 We are working hard to get everything we need for the new center in Lira – see how you can help with backpacks, tuition, tables, school supplies, books, and food. 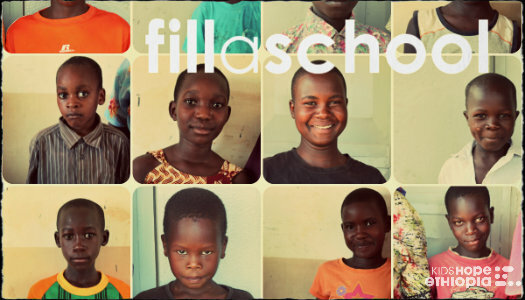 There are still a lot of items to fill – so share with your friends, and help us keep 50 children in school in Lira! 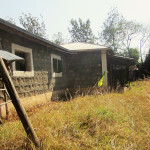 Our Lira, Uganda Education Support Center is getting prepared for 50 new students in the fall. 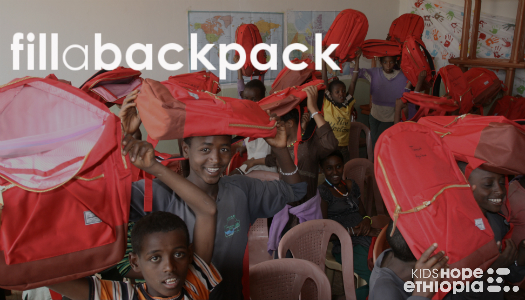 Help us fill a backpack for every child with a school uniform, shoes, a hygiene kit, and of course the backpack itself. $150 goes a long way in Lira. 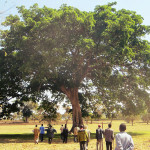 We are opening a new Education Support Center in Lira, Uganda this fall, and we are thrilled! There will be 50 children in the program, who will receive a hot meal a day, after-school tutoring, and tuition support, as well as much more. Help us get their Support Center filled and ready for them by filling up a desk – with notebooks, pencils, geometry sets, paper, and any other school supplies they need. 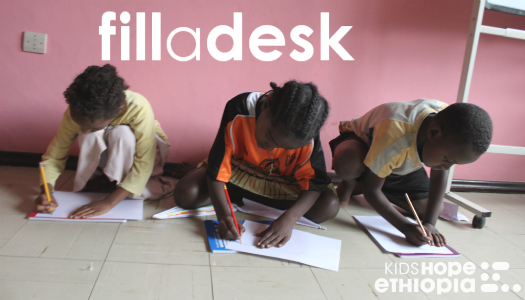 Each set of supplies only costs $60 – so share with your friends and help us fill all 50 desks with supplies for the students! 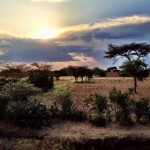 A new Education Support Center and Program will be opening in Lira, Uganda this fall. We couldn’t be more excited! 50 children in Lira will be enrolled in the center, and will have the opportunity to stay in school, receive educational support that they need, as well as medical support, a hot meal every day, and extra tutorial help with their school work. We want to fill up the Education Center with everything it needs: books, backpacks, hygiene kits, school uniforms, tables, desks, pay their tuition fees, and provide food for the hot meal program. You can donate one item for one child, or as many of each as you would like! 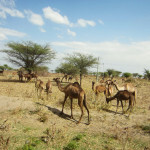 You can also make a general donation towards the new center at any amount. 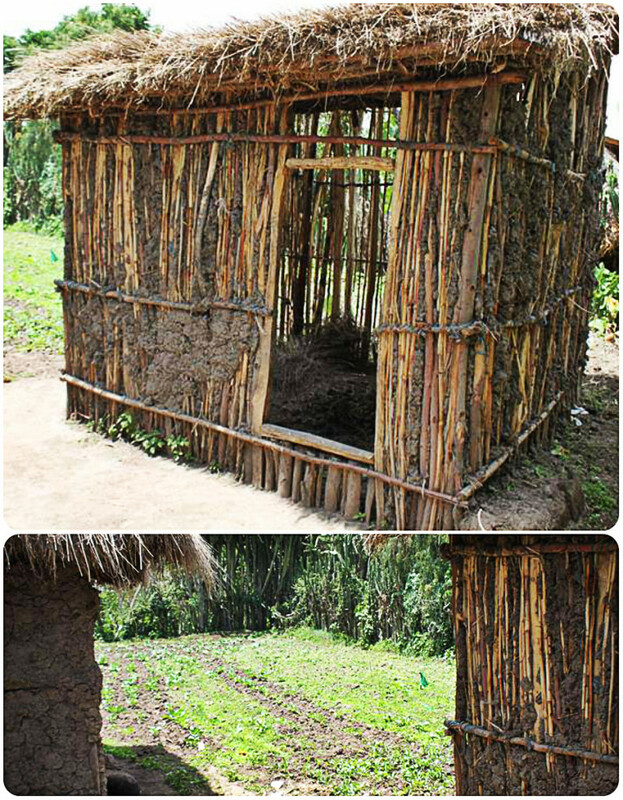 Help us Fill it Up in Uganda, and get our Lira Education Support Center off to a full start! 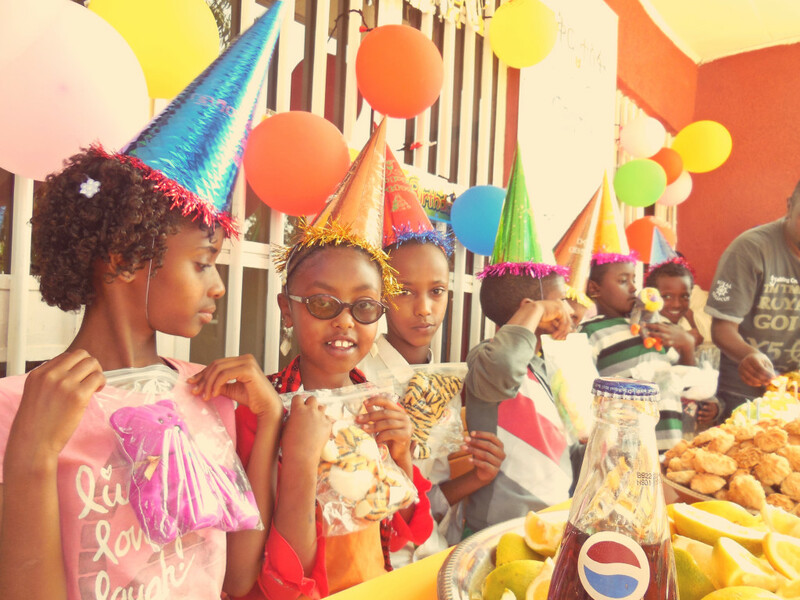 At the Love and Hope Center in Kality, Ethiopia the education support center staff has introduced a whole new kind of party to the children – a group birthday party. 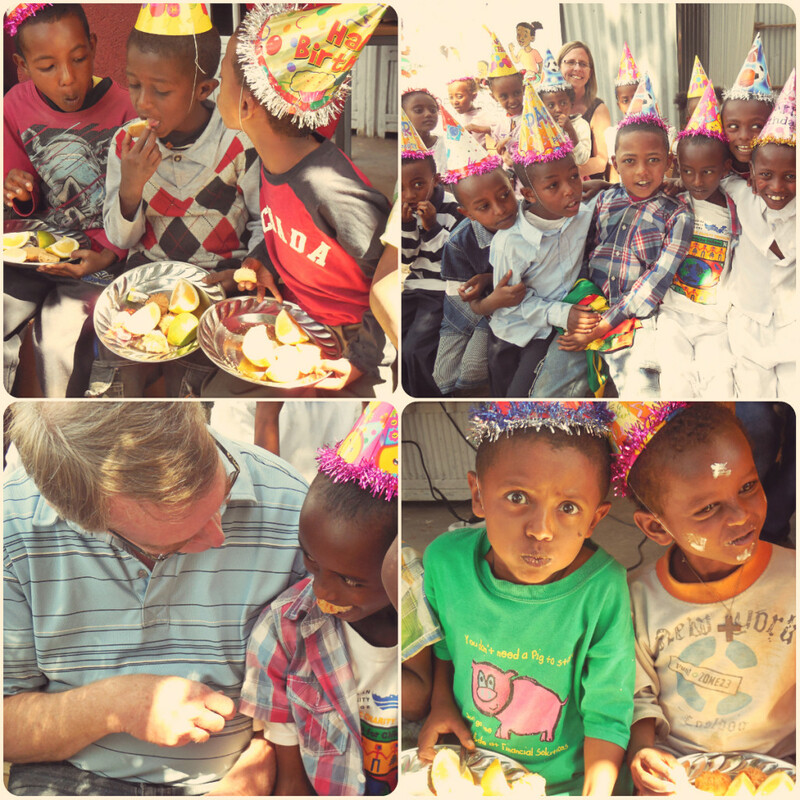 There are 70 children in the Kality education support program – and that’s a lot of birthdays! 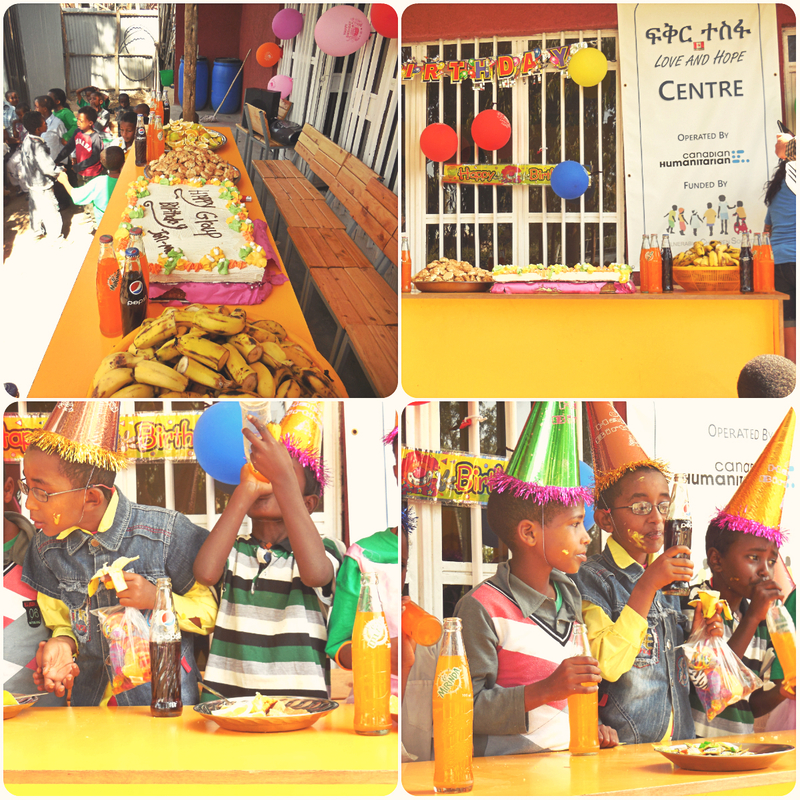 So every 3 months, the center gets together and celebrates all the birthdays that have happened since the last party. The children who have had those birthdays get to sit up at the head table, and everyone gets cake. 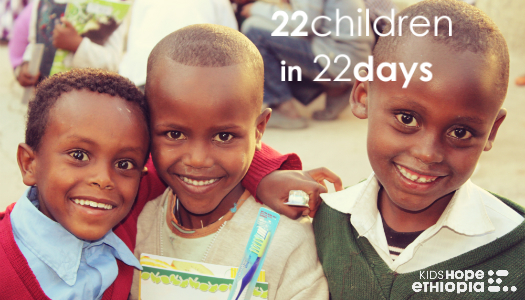 22 Children in 22 Days: 5 children sponsored! Since we started our 22 children in 22 days on May 9th we have had 5 children sponsored! 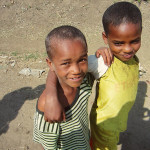 We have 8 days left, and 17 more children who are in need of sponsorship. 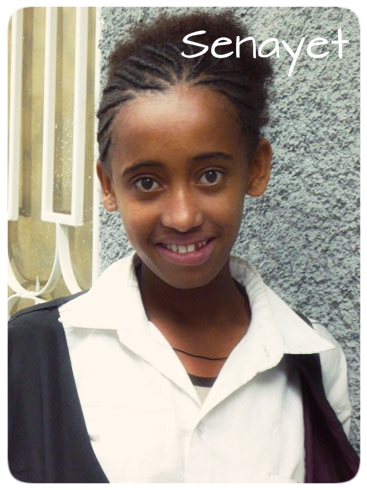 When a child enters our education program it changes their lives. 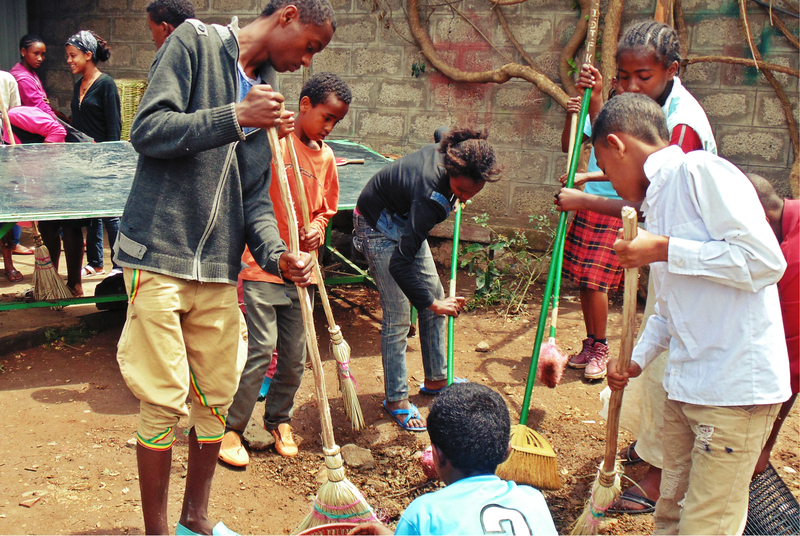 Tamrat, Teddy, and Eyerusalem are a few individuals who entered the Education Support Centers at a young age, and have now grown to be outstanding individuals. 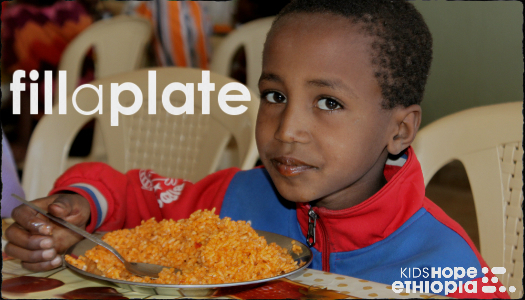 By sponsoring a child you give them hope, education, and love – so begin sponsoring today!